OXFORD, UNITED KINGDOM – November 6, 2009: For the second year in a row the BMW Group has cut its average CO2 emissions per car by more than any other automotive manufacturer. According to an independent report published by the European Federation for Transport and Environment, the average reduction across the industry was 3.3 per cent, while BMW Group achieved 10.2 per cent. BMW Group’s success in reducing CO2 is thanks to its EfficientDynamics programme which incorporates a wide variety of fuel-saving and emissions-reducing measures across the whole vehicle range as standard. Many of its competitors sell fuel efficiency packages as options. EfficientDynamics technology includes Auto Start-Stop, Brake Energy Regeneration and Active Aerodynamics, amongst a wide range of other features. This technology gives BMW and MINI owners outstanding fuel economy and low emissions without forsaking driving enjoyment. The result is the reduction of BMW Group’s average vehicle emissions in 2008 to 154g/km, down 10.2 per cent from 172g/km in 2007. 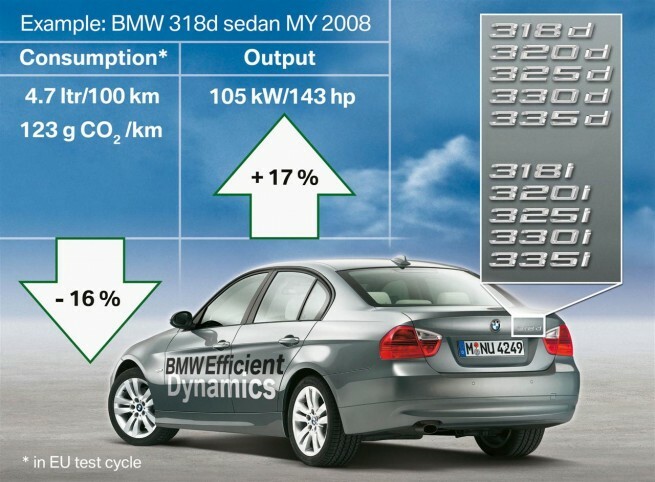 With the introduction of further efficient BMWs in 2009 this figure is expected to drop again. As further recognition of the class-leading position BMW Group vehicles command courtesy of EfficientDynamics technologies, the marque has scooped two more prestigious awards. The UK fleet industry presented the BMW Group with Fleet Car Manufacturer of the Year and the Industry Innovation Award. The former award was bestowed in recognition of the car manufacturer that had shown the greatest improvement in CO2 emissions, had expanded its range of low emission vehicles or offered alternative fuel vehicles. It is the second year in a row that the BMW Group has been award top honours in this category. The Industry Innovation Award was presented to the BMW Group because it had introduced new technologies that had such a significant impact on fuel consumption and emissions. BMW has also been named the “Most sustainable car company in the world” in the latest Dow Jones Sustainability Index for the fifth year in a row. Since its inception in 1999 BMW is the only automotive organisation to have featured every year on the index. This is the latest accolade in a string of environmental awards, most recently including Green Sports car and Executive car of the year awards at the What Car? Green Awards, Green Initiative and Manufacturer of the year at the BusinessCar Awards 2009 and the Special Editor’s Award for EfficientDynamics technologies at the Auto Express New Car Honours. Previous post Who said electric cars can’t be fast?